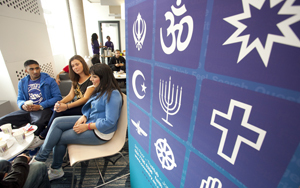 The Spirituality and Faith Centre, Coventry University, is a warm, safe environment for all students and staff irrespective of their beliefs. There are regular organised events and activities, such as retreats, meals, discussions and speakers, celebrating the rich cultural diversity of Coventry University and the City. The team of chaplains can link students and staff of most faith traditions with local communities.